Once again, Mel Brown on Impulse, released in 1971. 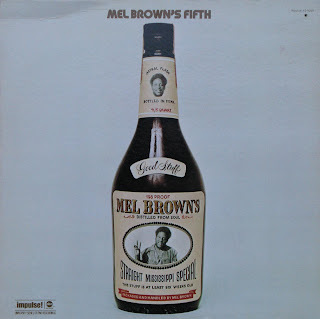 This one is a whole lot grittier than the other Mel Brown record I posted and it's a whole lot better too, if you ask me. The other players are Jimmy Davis on organ and keyboard bass, Jeff Osborne on drums, Carle Vickers on trumpet, Jake Riley on trombone, Lorenzo Carnegie on alto sax, Onion Miller on tenor sax, Tobie Butler on baritone sax, Clifford Coulter plays electric piano on one tune and Mel's father, John H Brown, contributes a vocal. Other than playing his guitar Mel also plays electric piano, sings and plays bass. The 10 minute jam, Luv Potion is dope. This Looks Great! Much Appreciated. Never seen this one before, thanks Steve. Going back to grab this one after heading Big Foot Country Girl. Thanks!